FREMONT, Calif. -- There is a world's record for just about everything, and a young man proved it Saturday by breaking one that most people would be surprised to know even existed. 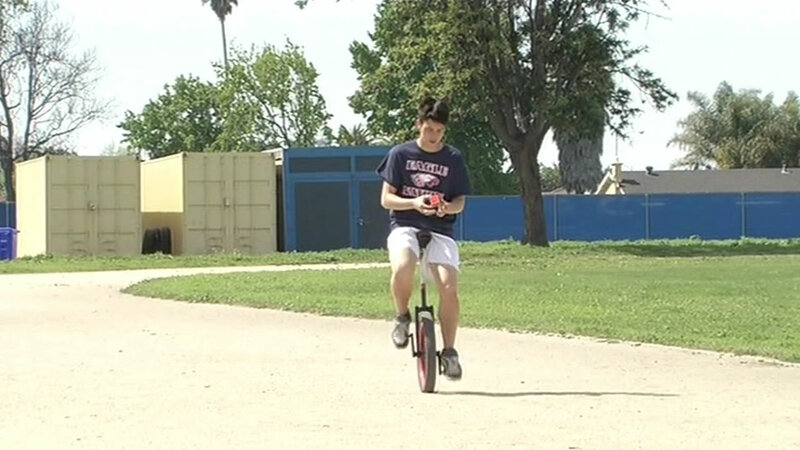 Sister station KGO in San Francisco was at Fremont's American High School where 16-year-old Owen Farmer took center stage atop a unicycle. Farmer solved 117 Rubik's Cubes while pedaling a unicycle. He not only left the old record of 80 in the dust, he did it while raising money for charity. "For my own personal satisfaction and to help out the charity that I'm fundraising for.," Farmer said. "It's called the Not for Sale Campaign, which helps aid human trafficking victims." Farmer will bring his unicycle to San Francisco Sunday to try and break two more records, the most stairs climbed on a unicycle and the most stairs climbed in 30 seconds on a unicycle.